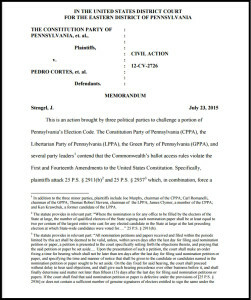 We’re pleased that the Court agreed with what the Libertarian Party of Pennsylvania has been saying for years: PA’s ballot access laws unconstitutionally restrict voter choice by compelling third-party candidates to submit thousands — if not tens of thousands — more signatures than Democratic or Republican candidates, and to defend those signatures at great cost in the court system. Citizens of the Commonwealth deserve choice at the ballot box, but it seems that the old parties will stop at nothing to prevent that from happening. During the 2012 election cycle, the LPPA, in conjunction with the national Libertarian Party, fought off a nine-week challenge to its slate of candidates — all designed to reduce voter choice and keep smaller government off the ballot. However, there is a clear path to restoring fundamental fairness to the election process in Pennsylvania: the Voters’ Choice Act (Senate Bill 495). The Voters’ Choice Act will reduce the outrageous ballot access requirements, now ruled unconstitutional, that make it exceptionally difficult for third-party candidates to appear on the state-wide ballot each Election Day. It will level the playing field for all political parties in the Commonwealth. And it will allow voters to choose their elected officials from a field of more than two choices. We call upon the state legislature to immediate adopt this bill and for Governor Wolf to sign it into law. Click on the thumbnail above or here to read Judge Stengel’s decision. +_+_+_+ like Irene answered I'm in shock that a mom can make $5437 in a few weeks on the internet .